RHG no longer part of Taragon Puteri project? The opening of Rendezvous Hospitality Group (RHG)'s new 445-room business hotel within the Taragon Puteri Kuala Lumpur integrated development remains uncertain. The reason is that Singapore-based RHG will no longer be involved in the project. RHG chief executive officer Iqbal Jumabhoy when contacted by Business Times said: "The management contract for Rendezvous Hotel Kuala Lumpur has not been activated because conditions for the lease and operations have not been met." The hotel was scheduled to open this month. "As a consequence, we have closed the hotel pre-opening office in Kuala Lumpur and have ceased marketing activities at this stage," Jumabhoy said via e-mail. A question on the likelihood that Rendezvous could return to Taragon, located on Changkat Thambi Dollah off Jalan Pudu, was unanswered. 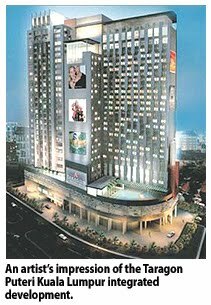 A check on RHG's official website still stated that "under the brands of Rendezvous Hotels and The Marque Hotels, the group comprises 15 hotels with 3,350 rooms across Singapore, Australia, New Zealand and China, including a hotel under development in Malaysia". A press release dated March 1 2010 on the appointment of Freddy Sim as the general manager for the hotel, is also available on the website. Meanwhile, a spokesperson for Taragon when asked about these developments said: "Work on the site is on schedule and the hotel will open by January 2011." In an interview with Business Times in March this year, Sim had said that Rendezvous was leasing the hotel portion and will also manage it. The duration for the lease was for 12 years plus six option years. This leasing agreement in itself is unique in the Malaysian market, as most hotel operators here either own and manage or solely manage hotels. RHG, a subsidiary of Straits Trading Co Ltd, is a relatively new but growing Singapore hotel brand. It plans to have 12,000 rooms by 2020. RHG manages hotels under the Rendezvous and Marque brand through Rendezvous Hotels & Resorts International. Asked about future openings for RHG in Malaysia, Jumabhoy said: "While we have no definite plans for Malaysia at this point in time, we are always on the lookout for any opportunity in the Asia-Pacific region." KLCC Property Holdings Bhd is looking to secure a single tenant for its 840,000 net lettable sq ft Prime A office space at the Lot C development, located next to the Suria KLCC shopping centre. "We are in discussions with a party," KLCC Property director Datuk Manharlal Ratilal told reporters after its annual general meeting in Kuala Lumpur yesterday. Lot C's office building is due for completion by October 2011. Its retail podium, which is expected to add another 140,000 sq ft of retail space to Suria KLCC, should be ready by the year-end, with the tenants moving in 2011. "The retail podium will be contiguous of Suria KLCC. It will complement the retailers there (Suria KLCC) and allow Suria KLCC traffic to flow into it," KLCC Property chief executive officer Hashim Wahir said. For the past three years, Suria KLCC has been registering more than 40 million footfalls (or the number of people who visit the mall) a year. Of this, 20 per cent are foreigners. Lot C has a development cost of close to RM1 billion. Another project planned for this year is the re-development of Kompleks Dayabumi. "We are conducting feasibility studies into it and hope to start work this year," Hashim said. No investment figure was given. "This is part of our ongoing effort to improve performance. Kompleks Dayabumi has a lot of room for improvement considering its location," Hashim said. For the current financial year, KLCC Property has managed to increase its office rental rate for Kompleks Dayabumi in Kuala Lumpur by RM1, from RM4 per sq ft to RM5 per sq ft through internal upgrades. On the performance of its sole hotel, Mandarin Oriental Kuala Lumpur, Hashim said, occupancy levels for the initial part of the year were back to levels seen in 2009. Last year, Mandarin Oriental's occupancy rate dipped by 10 per cent to 57 per cent. 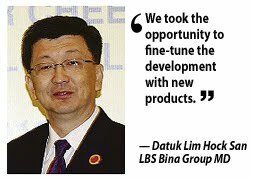 Property developer LBS Bina Group Bhd will launch its fourth project, worth over RM5 billion, in Zhuhai, China, in the second half of next year. The 60:40 joint venture of LBS and Jiuzhou Group, a Chinese government-linked company, has been delayed by three years because of the uncertain economic conditions. LBS managing director Datuk Lim Hock San said the master plan for the 76ha project comprising high-end residential properties was under way. He said that its launch had been delayed because of the global economic crisis. "We took the opportunity to fine-tune the development with new products. We estimate that the project's gross development value (GDV) will exceed RM5 billion," Lim said. The concept will be similar to the Tropicana Golf & Country Resort in Petaling Jaya, Selangor, which features a golf course, bungalow lots, high-end condominums and some commercial elements, among other things. Lim was speaking to reporters in Petaling Jaya yesterday after signing an agreement with MIMB Investment Bank Bhd, a unit of EON Bank Bhd, to act as the principal adviser and lead arranger for a RM135 million sukuk (Islamic bond) programme to finance LBS' projects. The signing was witnessed by Housing and Local Government Minister Datuk Wira Chor Chee Heung. The sukuk programme will be the first Islamic private debt securities issuance in the country to be guaranteed by Danajamin Nasional Bhd. Lim said that proceeds from LBS' fund-raising exercise would go towards its new projects in the country, such as Bandar Putera Indah in Batu Pahat, Johor; D'Puchong in Puchong, Selangor; and Taman Royal Lily in Cameron Highlands, Pahang. The projects, with a total GDV of RM600 million, are slated to be launched in the second half of this year. Lim also said that LBS was expected to be back in the black this year. It posted a net loss of RM16.8 million last year. "From January up until now, we have achieved RM180 million in sales. We expect more income in the second half of the year from our new launches. "The sukuk issuance will enable us to do property development on a whole new level. We are moving to medium- to high-end property development." LBS' landbank comprises 920ha in the Klang Valley, Batu Pahat, Cameron Highlands, Ipoh and China, which will keep it busy for the next 10 to 15 years. PETALING JAYA: Despite the uncertainty in the global economy, interest in KLCC Property Holdings Bhd’s (KLCCP) Lot C project is strong. Lot C will add 140,000 sq ft to the current one million sq ft of retail and office space in Suria KLCC. Director Datuk Manharlal Ratilal said the RM1bil development would be seamlessly connected to Suria KLCC. “The project will complement Suria KLCC which has attracted about four million visitors annually for the past three years,” he said. Of the 4.1 million visitors to Suria KLCC last year, 20% were foreign tourists. Manharlal said KLCCP was in discussions with some companies keen to rent units at Lot C.
“Global uncertainties come and go and when we are managing a property complex as important as this, it is our objective to maintain a position of strength. “We will not be too aggressive, (we will) think long term, make sure the project is good and not rush into things. For a complex such as this, we need time to plan,” he added. KLCCP is also managing the Petronas Twin Towers and Menara ExxonMobil, both of which are fully tenanted. It is planning to upgrade Menara Dayabumi. The company also owns Mandarin Oriental Hotel, which is 57% occupied now due to the global economic slowdown. SHANGHAI: China has denied it is easing restrictions aimed at cooling its red-hot real estate market, rattling Asia's major bourses on yesterday after reports that credit controls would be relaxed. Dealers said the official comments led share prices in Shanghai to close 1.62 per cent lower, with a knock-on effect on Tokyo and Sydney's markets, which also closed lower. Authorities in China have issued a slew of measures in recent months aimed at preventing the property market from overheating and causing a bubble that could derail the world's third-largest economy. The Ministry of Housing and Urban-Rural Development has urged local governments to strictly comply with lending policies designed to curb speculative investment in property, according to a statement dated Monday. The ministry said "positive changes had emerged in the property market" as a result of the measures and repeated it would increase the supply of affordable homes. Chinese property prices in June fell 0.1 per cent from the previous month, their first monthly fall since the first quarter of 2009, according to official data. The China Banking Regulatory Commission said in a separate statement that there had been no policy changes or revisions to mortgage requirements for second and subsequent home purchases. "Commercial banks must strictly implement these rules unwaveringly," it said. The remarks came after media reports said banks in first-tier cities including Beijing, Shanghai and the booming southern town of Shenzhen had resumed lending to buyers of third homes. The reports pushed Chinese markets up 0.80 per cent on Monday. The State Council in April said the down-payment for purchases of second homes must be at least 50 per cent and mortgage rates must be at least 1.1 times the benchmark rates. The down-payment requirement and mortgage rates for purchases of third or subsequent homes must be "raised significantly" in line with banks' risk management policies, the cabinet said at the time. Experts were mixed on how well the measures were working so far. Zhang Gang, an analyst at Central China Securities, told Dow Jones Newswires: "It's too early to expect property tightening measures to turn around as the property prices didn't significantly decline." But Alastair Chan, an economist for Moody's Analytics, said there were signs that government policies were having an effect. "China's residential property market is showing further evidence that the government's tightening measures are working, and the extent of the slowdown is likely to prompt a policy reversal in coming months," he wrote in a note. Tokyo and Sydney's stock markets were both down yesterday partly on the decline in Shanghai, traders said, reflecting increasing linkages between the countries' economies. In Chinese markets, property developers were hit yesterday shedding some of the gains from the previous session. China Vanke, the nation's largest property developer by market share, fell 2.4 per cent to 7.46 yuan, after having risen 5.5 per cent in the previous session. Poly Real Estate was down 4.3 per cent to 11.33 yuan after gaining 3.7 per cent the day before. MULTI-PURPOSE Holdings Bhd (MPHB) has signed three memorandums of understanding with Bandar Raya Developments Bhd to develop several pieces of land in Penang and Selangor. The two companies plan to combine their resources and expertise to development land owned by MPHB in Penang, Rawang and Gombak. Entry into the agreements is in line with MPHB’s objective to develop its landbank into viable projects. BRDB will be the developer of the proposed projects.